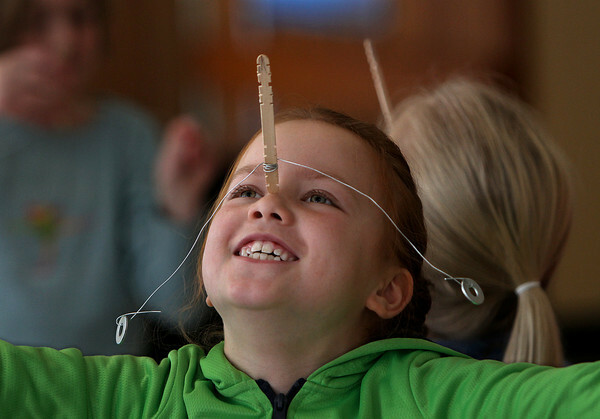 Third grader Calista Lai learns how easy it is to balance a stick on her nose when two weights are attached to wires Tuesday during a visiting science program at Manchester Memorial School. Michael Bergman of Wenham brought his "Top Secret Science" program to the school under the sponsorship of the Manchester Memorial PTO Enrichment Committee and the Manchester Cultural Council. The topic Tuesday was engineering. Students took part in hands-on experiments to learn some of the most basic principles in physics.